As noted when reviewing the new Squadron/Signal book on this vehicle, there are times when an idea seems great on paper, tests well, but the reality of its execution leaves much to be desired. Such was the tale of the Gama Goat, a high-mobility amphibious truck rated at 1 1/4 short tons capacity in cross country driving. The Gama Goat came out about the same time as the similar Swiss Metrac vehicle did, and both were designed to provide a high-mobility 6 x 6 vehicle. Each used the same basic design: a short 4 x 4 tractor unit with a permanently attached trailer with a driven axle. 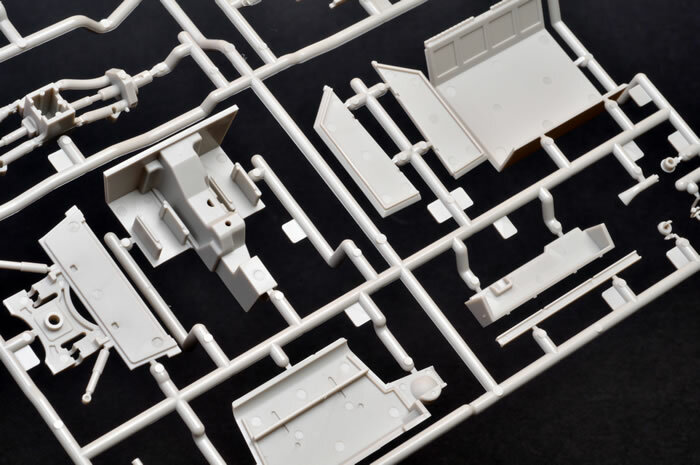 The body was designed to move in two directions only: up and down, to follow the terrain, and roll from side to side to accommodate bumps and obstructions. The body did not trail and would not turn to follow the tractor around corners (with the Gama Goat, if it did that it was grounds to immediately “deadline” the vehicle as unsafe). Robert Gamaunt, an American engineer, had been toying with a similar design since 1947, and in 1959 Vought Aviation took up the project to create a high-mobility 6 x 6 truck. The resulting prototype was all aluminum, powered by a 6-cylinder Chevrolet Corvair air-cooled engine, and weighed 3,000 pounds. 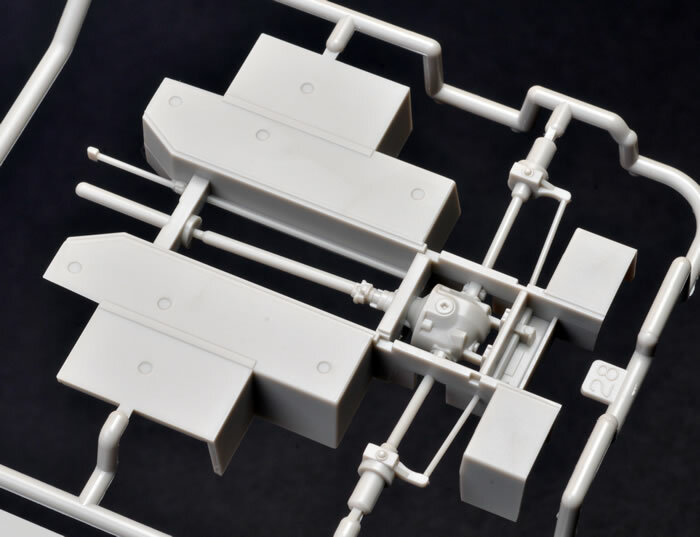 But while this eventually proved a successful design, it also had one of the key Achilles’ heels of the ‘Goat - the front and rear axles both steered, and keeping them in synch proved to be a nightmare. The prototypes entered testing in 1961 and went more than 6,000 miles mostly trouble free. But after testing in Thailand in 1963 and demonstrating great mobility in swamp and jungle terrain, the Army asked for some “changes” to be made. The Corvair engine was ditched, and after testing two engines the “winner” was a GM 3-53 diesel; a three-cylinder 103 HP wonder which on paper was half of the 6-53 engine then going into the M113A1. But it was a noisy, nasty engine which was mounted at head level behind the crew, and as such the crew always had to wear protective ear muffs when driving it. It remained amphibious, but now weighed around 7,000 pounds. Between 1968 and 1972 15,274 Gama Goats, officially the M561 6 x 6 1 1/4 Ton Truck, were built but CONDEC. The ‘Goat replaced the M37 3/4 ton trucks and the unhappy Jeep M715 series 1 1/4 tons trucks in many units, especially airborne, airmobile and “leg” infantry ones. In mechanized units the M561 was used either as an ambulance or a shelter carrier, usually with an S-250 class shelter and set of generators towed on a trailer. On a good day, the ‘Goat could do about 45 mph on highways with a 1,800 pound shelter and 3,000 pound generator trailer towed behind it. It had very good off-road capability and could climb amazing obstacles, even with the trailer attached. But it was a maintenance nightmare. Its steering gear rarely stayed aligned, and its “easily serviced” outboard brakes (they are on the outside of the wheel and not inside like 99% of other vehicles) were nearly impossible to properly bleed and adjust. Since it was so articulated, it had around 22 universal joints, the failure of any one of which could bring the vehicle to a halt. 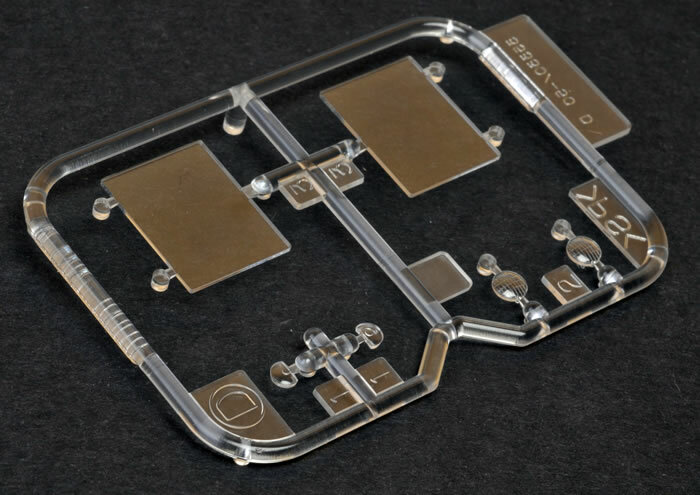 If the emergency switch inside the body was inoperative, the vehicle was theoretically deadlined (but with a shelter on the back – which went empty nearly all the time when the vehicle was moving - who was going to crawl over and press it?) Also any damage to the tailgate meant it would not float (a moot point with a shelter and generator trailer anyway). The ‘Goat first began to be replaced by the M1008 CUCV family of Chevrolet 4 x 4 trucks as they were rated as 1 1/4 ton trucks, but suffered a loss of off-road mobility as a result. The ultimate replacement was the M996 High Mobility Military Vehicle series or Humvee. 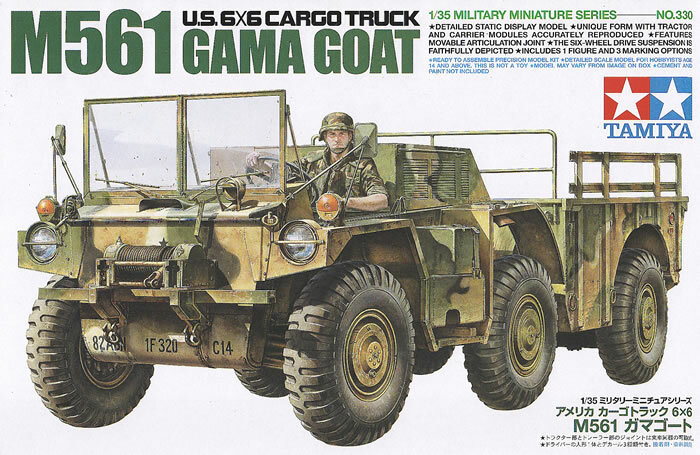 There have an HO scale plastic Gama Goat from ROCO and several vacuform or resin kits produced over the years of the ‘Goat, and I scratchbuilt one in 1984 when I was a platoon sergeant signed for 12 of these beasts. 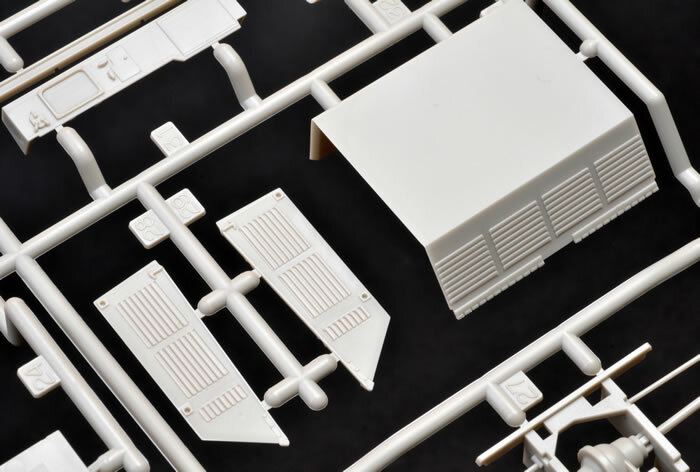 Tamiya surprised everyone in 2013 by coming out with the first 1/35 scale injected molded kit of the M561. 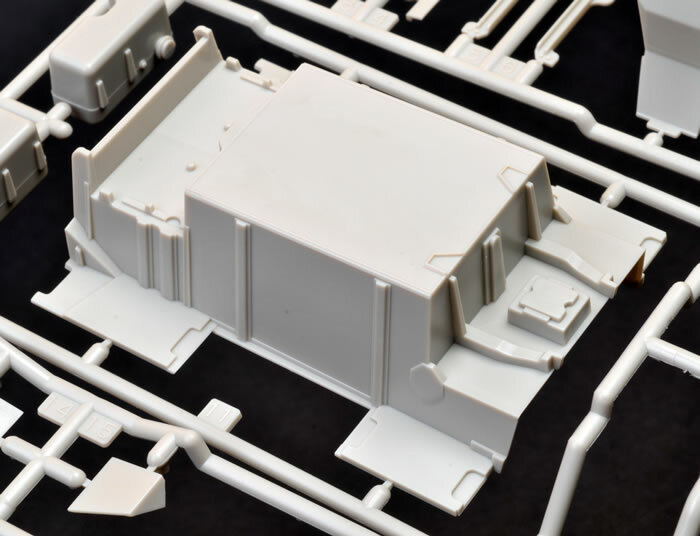 The kit provides for a stripped-down personnel carrier variant of the Gama Goat as used by the 82nd Airborne Division, the 3rd Marine Division, or one from the Army Reserves in 1976. I say “stripped down” as most other Army units used it as a shelter carrier or ambulance, the former with an S type shelter loaded and held down by turnbuckles and the latter with the canvas body cover and red crosses in place. Nearly all had their canvas roof in place, and many in Europe sported “hard top” cabs with cab heaters installed. 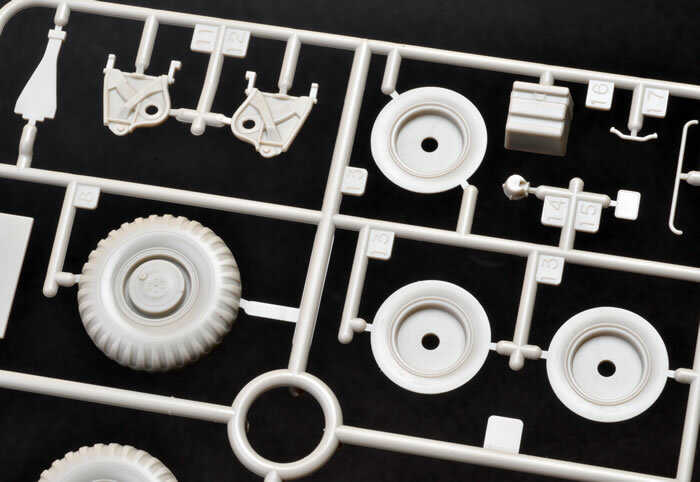 Tamiya provides none of that with the kit. Assembly is pretty straightforward. 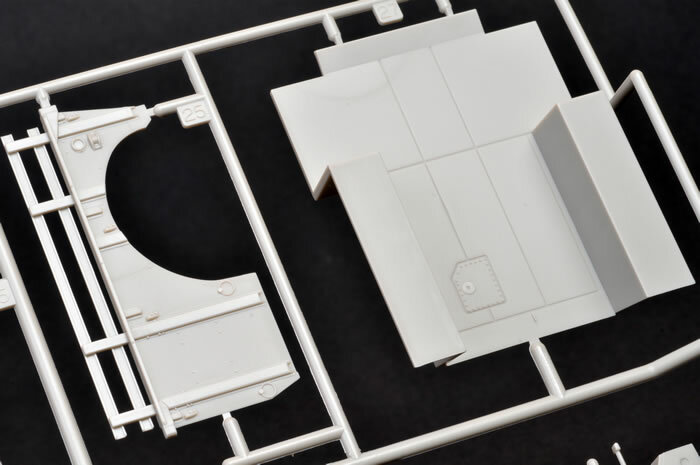 The best feature of the kit is a slick assembly that permits the body to react as the real ones did, namely rolling and pitching but not turning. This is done with a poly cab trapped in the connection assembly and permitting the body to be removed (rarely done except at a depot in service) as needed for finishing. The interior is fairly complete in regard to controls and decals are nicely provided for all of the warning and indicator placards (and there were a LOT in the Gama Goat!) The control pedals (three, as the ‘Goat had a 4-speed manual transmission) are all missing. No heater is provided for the cab (not a big deal if the “hard top” is not provided either). Seats are a good match for the originals and while the seat controls are not present they were hard to see and use in the original as well. The kit provides an alternative winch, but the cable drum comes with a molded cable and no hook or clevis assembly. Towing clevises (under the bumper) are also missing. 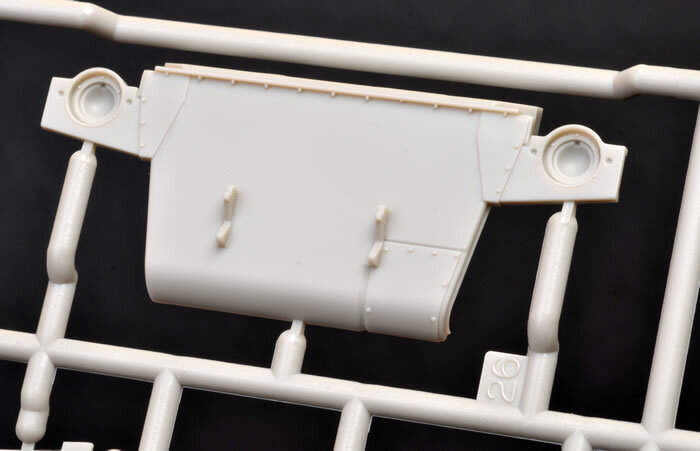 The hood is nicely done, but is the angular version; half of mine at Hood were stamped ones, so am a bit sorry Tamiya did not offer the choice. 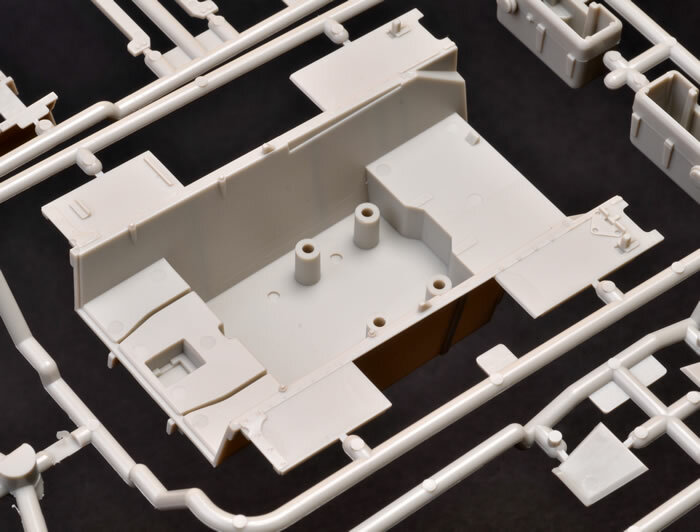 One major error in the body section is that Tamiya missed the “emergency stop” alarm switch panel on the front of the body interior wall. This was to provide the passengers with a way to warn the crew if something was wrong, as they cannot be heard over the engine. For vehicles used for swimming, it was an immediate “deadline” item if inoperable. There are also a lot of ejection pin marks, but most of them are either on the bottom of parts or difficult to see. 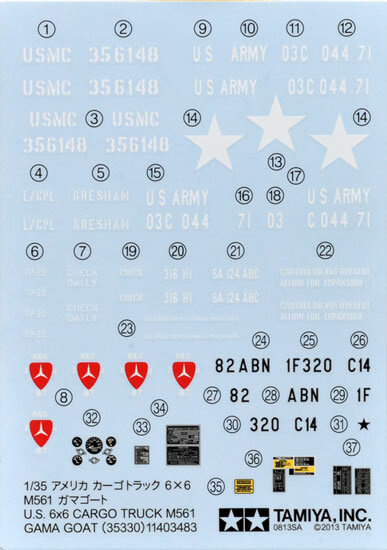 Decals are up to Tamiya’s usual nice level and finishing directions are clear. Overall, this is a bit of a disappointing kit unless you want an 82nd Airborne one. 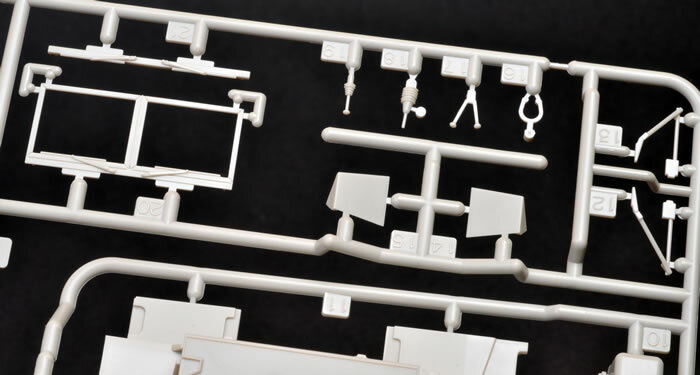 As noted, Tamiya COULD have added a few more details for the cost of the kit and made it a really outstanding effort.